Pros A top choice for its impeccable laser technology, accuracy, and reliability over time. Cons The instructions in the owner's manual can be confusing. 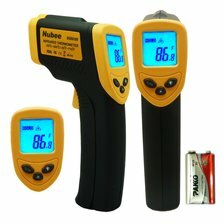 Summary The best infrared thermometer on the market. This product pays for itself with dependable performance and durability. 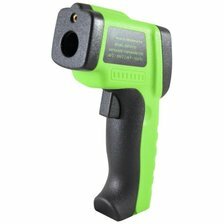 Pros Appeals to customers seeking a fast, yet accurate infrared thermometer. Cons The display is a bit dim outside. 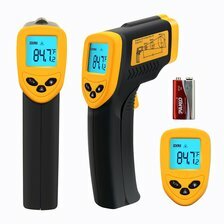 Summary It boasts numerous features but this thermometer is a bit expensive for customers interested in a basic infrared thermometer. Pros Stands out for its ability to be used in a wide variety of settings. Cons Complaints about unreliable readings and quality issues are relatively common. Summary This thermometer suits basic demands, but those needing a dependable product for work should look elsewhere. Pros An extensive temperature range and ability to read temperatures in Celsius and Fahrenheit sets it apart from competitors. Cons Temperature readings aren't always 100% accurate. Summary While it's not a poor investment, there are more precise thermometers in this price range. Pros The red laser pointer ensures precise aiming and measurement. Cons Questionable temperature readings around other heat sources. 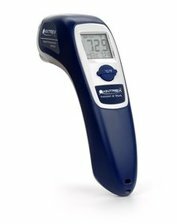 Summary It's virtually impossible to find another thermometer that matches the performance and reliability of the Etekcity at such a low price.